Military life takes some getting used to; you don't quite know what to do until you are experiencing it, and then it's merely overcoming challenges as they arise. However, there are ways you can prepare yourself to become a military family. As with many events in life, the better you prepare yourself for them ahead of time, the better you are able to deal with them when they occur. There are many ways to prepare to become a military family, such as drafting a parenting plan that deals specifically with situations that frequently pop up in military families. Understanding some of the most challenging situations for families with a service member can help you know what to do when they come up, and having a plan can help guide you during the difficult moments. One of the first experiences people have as a military family is the anguish of having their service member gone for a long time. It starts with boot camp and then deployments. While boot camp is set for a specific length of time, deployment times can vary at the outset, and can change in an instant. To deal with these separations it's important to remain flexible. Don't set yourself up for a big disappointment when he doesn't come home the day he said he would. Instead, it may be helpful to accept that he will eventually come home and keep yourself as busy as possible in the meantime. A part of becoming a military family is standing strong and proud of your service member. 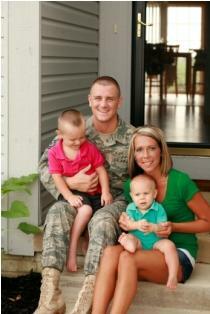 As your loved one is serving the country, he needs to know that his family is behind him. Taking care of the home front will help your partner tremendously. He will appreciate that he doesn't have to worry about his work as well as his home life. It's also important to help him through the separation because military personnel long for the comfort of their family's embraces, smiles, and conversation. Giving him encouragement by telling him that he is doing an honorable and courageous job can mean so much. It can be difficult to deal with a loved one who deploys for a few months, or a year, and then comes home. When the service member deploys, life without him physically present goes on and a routine establishes itself. When he returns home, family dynamics and routines change once again because the previously-absent member of the family also needs consideration in plans. This change can be extremely stressful for a military family, and flexibility is the best way to handle this situation. The service member needs to understand that he is entering into routines that were established in his absence and he needs to be patient as his loved ones readjust to his presence. Family members also have to be flexible in allowing the service member to enter the routine without complaints. The entire family needs to come together to create new routines. Keep in mind that the family dynamics may change with every deployment and subsequent homecoming. The key is to be patient and flexible so you can mold the family around any given situation. All family members need attention and support while their loved one is in the service. Parents, military spouses, and children need as much support as service members themselves. When becoming a military family, everyone must come together to hear feelings and thoughts. Knowing there are people you can turn to during difficult times can be a big relief and make military life less traumatic. Being in the military is like joining a large family; everyone goes through similar experiences, which is what brings people together. Reaching out to members of other military families helps you appreciate the feats your service member is performing, and if you ever need anything while your loved one is deployed, military dependents are right by your side to help you with whatever you need, just like your own family would. Check out the National Military Family Association for valuable support and advice. As your loved one becomes a service member, you will find yourself propelled into a military family. While military life is not always easy, you can make it easier by remaining patient, flexible and keeping an open mind and an open heart.